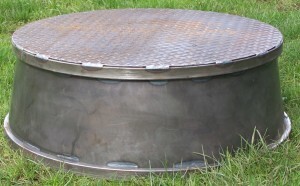 Economy Steel Equine Performance Pedestal with free 48 state shipping! 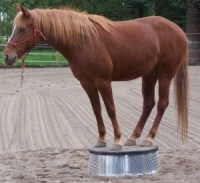 Brand New steel horse pedestal as used by prominent Natural Horsemanship trainers. You see the big name equestrian trainers using Pedestals like this in their videos and demonstrations. They are a wonderful training tool to have but until now a quality unit has not been easy to obtain. 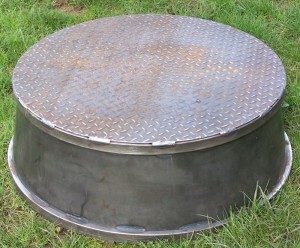 This is our “Economy Steel” model and it is the lowest price pedestal we make yet it is still very rugged. Made entirely from steel this pedestal has a top that is 32″ wide with a wider base for stability. 12″ tall. The weight is just under 70 lbs and it can be easily tipped up on edge to roll it around. Please see our other listings or contact us about the deluxe lightweight aluminum model also available now. In order to keep the cost down we build this model from steel using floor plate, or diamond plate for the top surface. This provides some traction but if you need more grip you can easily add a piece of thin stall mat to the top by gluing it on with contact cement. The other cost cutting measure is that the pedestal is left in bare metal. You can paint it your choice of colors or leave it to rust which will not affect the usability of the platform. Shipping on this pedestal is included in the price for any location in the 48 states. If you need a pedestal shipped to another location please contact us for a shipping quote.